General Motors has announced that the all-new 2014 Cadillac CTS sedan will start at $46,025 after a $925 destination charge, which is $6,035 more than the 2013 model. GM says in a press release that the 2014 CTS will offer 20 new standard features, as well as “more interior space, power and technology” when it hits dealerships this fall. 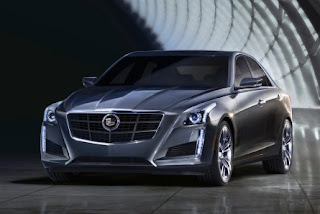 The 2014 CTS will be offered with the choice of a turbocharged 2.0-liter four-cylinder engine or a 3.6-liter V6, as well as rear- or all-wheel drive. The automaker says that the V6 generates 321 horsepower. The turbo-four equipped CTS sedan will produce 272 horsepower and accelerate from 0 to 60 mph in 6.1 seconds, which makes it 1.5 seconds quicker than the 2013 CTS. A more powerful CTS Vsport model will also debut with a starting price of $59,995 after a $925 destination fee. The CTS Vsport will come with a new 420-horsepower, twin-turbo 3.6-liter V6, which is paired with an eight-speed automatic transmission and rear-wheel drive. Edmunds reports that the CTS Vsport is not a replacement for the 2013 CTS-V sedan, which starts at $65,410 after an $895 destination fee and a $1,300 gas-guzzler tax. Cadillac Spokesman David Caldwell told Edmunds that the CTS Vsport will not carry a gas-guzzler tax. The current CTS sedan ranks highly among upscale midsize cars, where it competes with models like the BMW 3-Series, Infiniti G37 and its sibling, the Cadillac ATS. However, some auto writers say that the new CTS’ larger size makes it more fit to compete with luxury large cars like the BMW 5-Series. Jalopnik writes, “Instead of being somewhere between a 3 and 5 series BMW, the CTS has gone full 5 series.” The 2014 Cadillac CTS will start at about $3,800 more than the Audi A6, but it also undercuts the Mercedes-Benz E-Class and 5-Series by roughly $5,900 and $1,800, respectively. Unlike the sedan, the CTS Coupe and CTS Sport Wagon will carry over unchanged for the 2014 model year.